The round rope leashes are comfortably soft to hold in your hand, yet highly durable. Resembling climbing ropes in structure and materials which make them strong a durable. 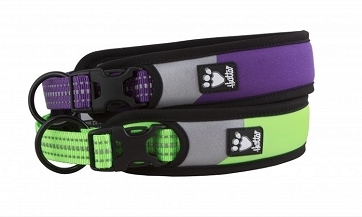 The training leash design make the leash extremely flexible and adjustable as it has a trigger hook in each end so you can adjust the length by clipping the second hook to the ring at the desired length. You can also use the leash on two dogs which reduces the amounts of leashes you need to bring with you on walks. Please see video for demonstration. 3M reflectors for added visibility and safety. The black metal used for trigger hooks and rings are aluminium, which is highly durable, stainless and extremely light. 98" long 3/8" wide (250cm x 8mm). Matches the Hurtta Collars and Harnesses. In stock in Raven (Black) and Cherry (Bright Pink). Perfect for all sorts of dog sports and more! I purchased this leash with the intent of using it for my young pup in the sports we plan to excel in. All the adjustable loops are in great places to make a 6ft, 7ft and even 8ft if you plan on tracking! For an added bonus, my pup tugs often and that was another reason I got the leash and it is holding up to her tugging and shaking. I also found this useful for myself as I like to clip my leashes over my shoulder and chest and it perfectly fits. The visibility is another wonderful touch! I ordered 3 of these leashes and love them. I love that you can adjust the length of the leash to many different sizes. If you have a larger dog, you can even clip the leash shorter to make a loop "slip collar" around the dogs neck or a "handle" for the leash. I can loop it around my shoulder/body when not in use while off leash hiking, but it still allows easy access to quickly leash my dogs when hiking while the leash is still around my shoulder. Really this is the perfect multi functional leash! Bought it for my 100lb ridgeback and I love it. Durable, long enough, very light and easy to click between hooks. The visibility is another thing I do appreciate specially during cloudy days and night. A well made, versatile leash! This leash is so versatile and of excellent quality. The extra rings let you choose which length you want throughout your walk. It is also great to walk two dogs at once. I am really getting a lot of use out of this leash. These leashes are so awesome. They feature very secure rings at different points so you can fully adjust the length, you can adjust it to have a hand-loop or even around your waist or shoulder. I have been using it to walk 2 dogs at once and it has been great. Very durable and the high visibility reflecting material is woven in and seems like it won't be flaking off like cheaper reflective leashes on the market. I think I need another one it is just that good! Q: How long is this leash at its longest possible configuration? If you make the smallest possible handle loop, the total length of the leash will be 90" (7.5ft). Yes, I would say it’s suitable for a small dog. I use it for my 22 lbs German Pinscher with no problem. The trigger hook is fairly lightweight and not bulky. Q: The names of the colors are confusing. What do I order if I want blue or light green or pink? I'm sorry you find the colors confusing. If you want Pink there's both Cherry and Raspberry. Light Green you need to choose Birch. Blue is no longer available from Hurtta. Q: Never mind..it is on the order form. Might be helpful to have it in the description as well? Thanks. I'll make sure to make it more fool proof. The colors are also described underneath each picture when you click on them.